A key way to view Latina plays today is through the foundational frame of playwright and teacher, Maria Irene Fornes, who has trained a generation of theatre artists and transformed the field of American theatre. Fornes, author of Fefu and Her Friends and Sarita and a nine-time Obie Award winner, is known for her plays that traverse cultural, spiritual, and aesthetic borders. 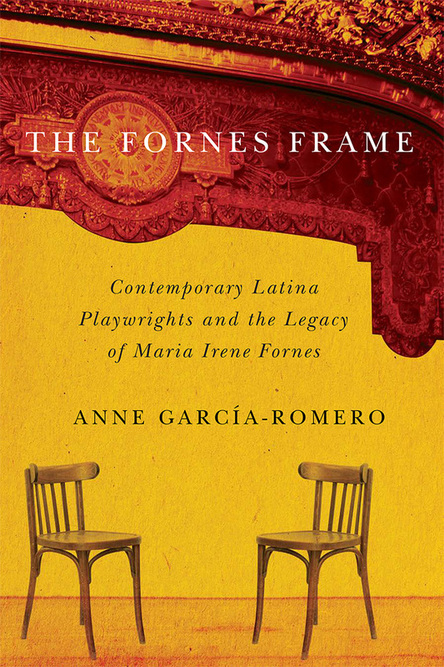 In The Fornes Frame: Contemporary Latina Playwrights and the Legacy of Maria Irene Fornes, Anne García-Romero considers the work of five award-winning Latina playwrights in the early twenty-first century, offering her unique perspective as a theatre studies scholar who is also a professional playwright. The playwrights in this book include Pulitzer Prize–winner Quiara Alegría Hudes; Obie Award–winner Caridad Svich; Karen Zacarías, resident playwright at Arena Stage in Washington, DC; Elaine Romero, member of the Goodman Theatre Playwrights Unit in Chicago, IL; and Cusi Cram, company member of the LAByrinth Theater Company in New York City. Using four key concepts—cultural multiplicity, supernatural intervention, Latina identity, and theatrical experimentation—García-Romero shows how these playwrights expand past a consideration of a single culture toward broader, simultaneous connections to diverse cultures. The playwrights also experiment with the theatrical form as they redefine what a Latina play can be. Following Fornes’s legacy, these playwrights continue to contest and complicate Latina theatre. "It takes time to appreciate fully the impact of a writer’s work and her teachings. This eloquent book is the result of Fornes's legacy and the many Latina writers she inspired."